During Paramount's CinemaCon presentation yesterday, the studio brought out director Michael Bay along with stars Mark Wahlberg, Laura Haddock, and Isabela Moner to introduce more than 20 minutes of footage from Transformers: The Last Knight. Ever since The Last Knight title was unveiled, fans have been curious about what exactly it means, as rumors began to spread about a medieval connection to King Arthur and his mythical Knights of the Round Table. During one particular scene in this CinemaCon footage, it seems that this Last Knight has in fact been unveiled, and it's not who you may expect. ComicBook.com was present at the event, revealing a detailed rundown of the footage that was put on display at the Las Vegas convention. 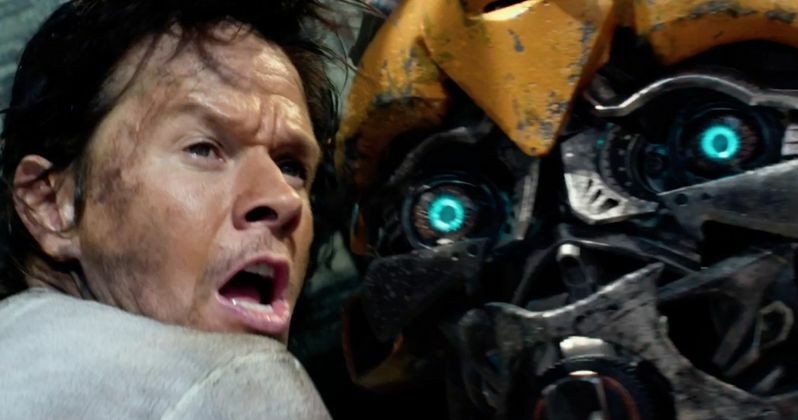 Among these scenes is one where Cade Yeager (Mark Wahlberg) is told by a "human-looking robot" named Corpin (who may be the British Transformer previously revealed as Cogman) that he has been "chosen." Another scene shows Anthony Hopkins' Sir Edmund Burton "rubbing his staff on Cade's arm," asking him if he's ever wondered why the Transformers keep coming to Earth. Other reports explain that this same footage shows Cade finding a medallion from King Arthur, with the seal transforming around Cade's arm, which all reveals that Cade Yeager is in fact The Last Knight. The presentation opened with footage from King Arthur's medieval era, in the midst of a battle, with Lancelot asking for a magician. King Arthur questions this tactic, before Merlin discovers a staff with Transformer markings on it. There is another scene with Sir Burton that shows a flashback to the original 12 Knights of the Round Table, along with 12 Transformers from Cybertron who fought alongside them in an alliance between man and machine. The legend told that there would be one knight who was chosen to save the world, which is Cade Yeager. Although it isn't explicitly stated in the footage shown at CinemaCon. The footage also featured new details about how Bumblebee fits into the story, which teases that he may have been on Earth much longer than initially believed. Part of the CinemaCon footage includes another scene with Sir Edward Burton, who is joined by a British transformer whose been around since World War I, with Burton revealing that he met Bumblebee when he was just a boy. This tiny tidbit of information reveals that Bumblebee has been around since at least the 1940s, perhaps even earlier. When we met Bumblebee in the first Transformers movie, he took the shape of a 1977 Camaro, hinting that he's been on Earth since the late 1970s. A few months ago, producer Lorenzo di Bonaventura teased that Transformers: The Last Knight will offer some connections to the Bumblebee spin-off, which Paramount has set for release on June 8, 2018. We reported earlier this month that Laika co-founder and Kubo and the Two Strings director Travis Knight has signed on to make his live-action directorial debut with this Bumblebee project, although it isn't clear when filming may begin. Hopefully we'll get to learn more about Transformers: The Last Knight as we get closer to its June 23 release date.